Hosts Sarah Michelle Gellar and Jack Black appear to be totally unashamed of their freakish little arms and hands. Deep in a forest of magic dancing popcorn, the best looking co-hosts we've ever seen appear to be lost and maybe a little bit afraid. Jack Black cuts right to the chase and proposes to Sarah Michelle Gellar not 3 minutes into the show. Jack Black's cartoon-like dance moves perfectly match Sarah Michelle Gellar's ballerina grace. Ewan McGregor privately reminds Nicole Kidman that she used to be married to Tom Cruise as they except the Golden Popcorn for Best Musical Sequence in Moulin Rouge. We had to cut this one off at the waist because there are hundreds of women clawing at their legs. Vin Diesel and Paul Walker play it cool and accept Best On-Screen Team for The Fast and the Furious. Happiest winner of all time right here. Reese Witherspoon makes Roberto Benigni look like Eeyore as she accepts Best Comedic Performance for Legally Blonde. Weird. So he just always looks like that? 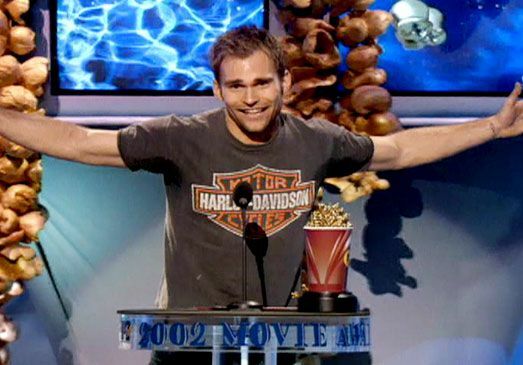 Stif-err-Seann William Scott accepts the honors for Best Kiss (with Jason Biggs in American Pie 2). 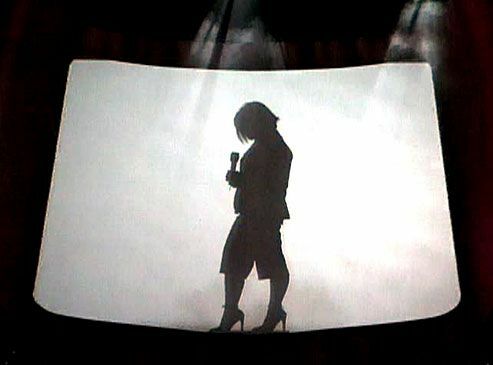 Kelly Osbourne is cast in stark silhouette as she performs "Papa Don't Preach" at the 2001 MTV Movie Awards. Close-up! She's not really black and white! Kelly Osbourne shocks and awes with electric red hair dye and midnight nail polish. How is it that she always glows? Ever-elegant Mandy Moore wins Best Female Breakthrough Performance for A Walk to Remember. 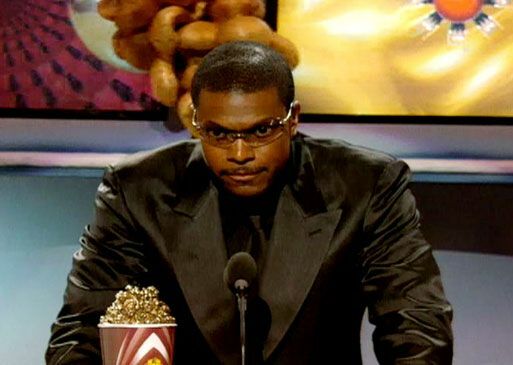 If Jackie Chan wasn't so busy walking up a wall to kick a window washer in the face, he would have joined Chris Tucker in accepting the award for Best Fight in Rush Hour 2. 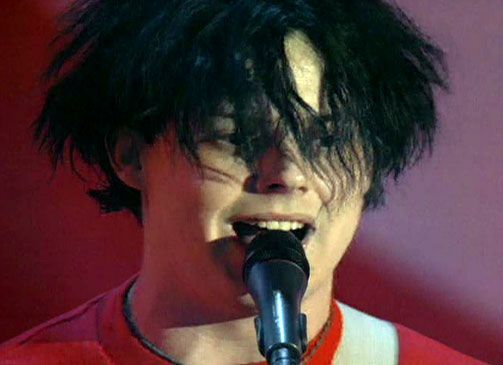 Jack White channels dark forces as he screams through a blazing medley of "Fell In Love With A Girl" and "Dead Leaves And The Dirty Ground." 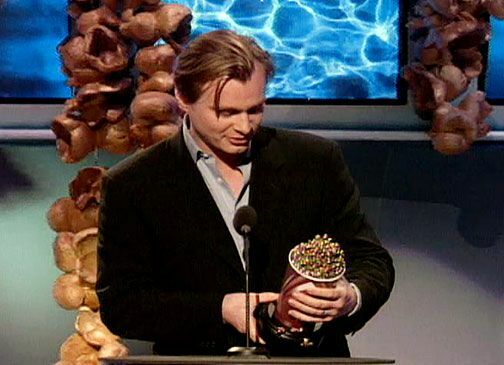 Director Christopher Nolan wins Best New Filmmaker for his innovatively backwards psychological thriller, Momento. 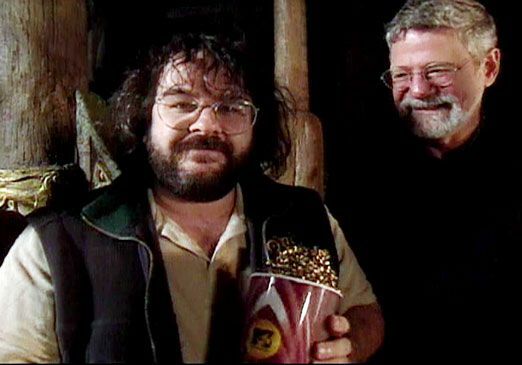 Meanwhile, back in the tree house, Peter Jackson and Barrie M. Osborne accept Best Movie honors for Lord of the Rings: The Fellowship of the Ring in matching glasses.